Republican reaction to Obama's SCOTUS nomination of Merrick Garland. 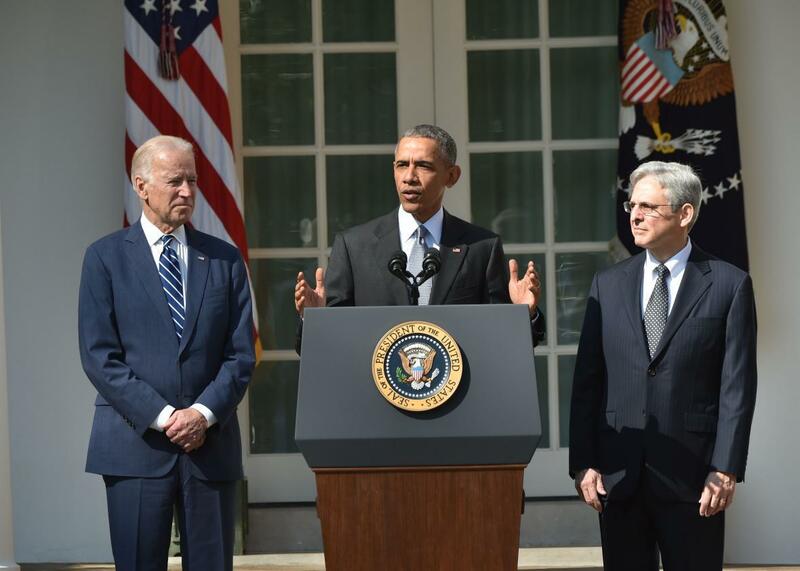 President Barack Obama, with Vice President Joe Biden, announces his Supreme Court nominee, Merrick Garland, right, in the Rose Garden at the White House on March 16. President Obama nominated Merrick Garland for the Supreme Court on Wednesday, putting a face to a partisan debate that had been raging since the late Justice Antonin Scalia died more than a month ago. You can read Slate’s analysis of Obama’s pick and what it means for the high court and for the 2016 election here. Below, we’ll be rounding up the reactions from key players as they come in throughout the day. We think the people should choose as we’ve said repeatedly. The American people may well elect a president who decides to nominate Judge Garland for Senate consideration. The next president may also nominate someone very different. Either way, our view is this: Give the people a voice in the filling of this vacancy. It seems clear that President Obama made this nomination not with the intent of seeing the nominee confirmed but in order to politicize it for purposes of the election. It’s also important to remember the type of nominee President Obama said he’s seeking. He says his nominee will arrive at ‘just decisions and fair outcomes’ based on the application of ‘life experience’ to the ‘rapidly changing times.’ The so-called empathy standard is not an appropriate basis for selecting a Supreme Court nominee. … “A lifetime appointment that could dramatically impact individual freedoms and change the direction of the court for at least a generation is too important to get bogged down in politics. The American people shouldn’t be denied a voice. Grassley voted against Garland’s confirmation in 1997 to his current position as the chief judge of the U.S. Court of Appeals for the District of Columbia Circuit. The Iowa senator’s opposition, though, wasn’t about Garland but because he thought that specific court already had too many judges on it. “The issue is not Mr. Garland,” a Grassley spokeswoman told the New York Times then. “Clearly the evidence does not support filling the vacancy at a cost to taxpayers of $1 million a year,” citing his estimate of the total cost of an extra judicial chamber. Orrin Hatch, a senior Republican member of the Senate Judiciary Committee, speaking shortly after Wednesday morning’s announcement was reported but before it was official: “The right course of action is to wait until the next year’s election … let the American people decide. Rather than have an insider’s political tug-of-war between the President and the Senate over a Supreme Court nomination, the American people should decide through this year’s election. So I’ll be doing everything I can to give the American people a voice. The President is well within his constitutional authority to name a nominee – and the Senate is well within our constitutional authority to not hold hearings or a vote. President Obama has less than a year left, but a Supreme Court Justice will impact our country for decades, and this is something we shouldn’t take lightly. Garland is exactly the type of Supreme Court nominee you get when you make deals in Washington D.C. A so-called ‘moderate’ Democrat nominee is precisely the kind of deal that Donald Trump has told us he would make—someone who would rule along with other liberals on the bench like Justices Ginsburg and Sotomayor. Make no mistake, if Garland were confirmed, he would side predictably with President Obama on critical issues such as undermining the Second Amendment, legalizing partial-birth abortion, and propping up overreaching bureaucratic agencies like the EPA and the IRS. We cannot afford to lose the Supreme Court for generations to come by nominating or confirming someone that a dealmaker like Donald Trump would support. Washington dealmakers cannot be trusted with such crucial lifetime appointments. I proudly stand with my Republican colleagues in our shared belief—our advice and consent—that we should not vote on any nominee until the next president is sworn into office. The People will decide. I comment Mitch McConnell and Chuck Grassley for holding the line and ensuring that We the People get to exercise our authority to decide the direction of the Supreme Court and the Bill of Rights. John Kasich told a crowd at Villanova University, that President Obama shouldn’t “stiff the legislative body” by trying to rush through a confirmation process. For 100 years we’ve had these hearings in public. … I hope that President Obama’s nomination of an exceptionally qualified and consensus nominee will persuade the Senate Republicans to change course. … Give President Obama’s nominee a meeting, a hearing and a vote. There is more than enough time for senators to publicly and thoroughly examine Chief Judge Garland’s qualifications and vote on his confirmation before Memorial Day. For more than 40 years, the Senate has held a confirmation vote on Supreme Court nominees on average 70 days after their formal nomination. The Senate should afford Chief Judge Garland the same process with a fair and public hearing in April, and the full Senate should vote on his confirmation by May 25. It is the President’s Constitutional responsibility to nominate justices to the Supreme Court, with the advice and consent of the Senate. Today, in announcing Judge Merrick Garland as his nominee, President Obama has met his responsibility. He has chosen a nominee with considerable experience on the bench and in public service, a brilliant legal mind, and a long history of bipartisan support and admiration. Now, it’s up to members of the Senate to make their own, and perform the Constitutional duty they swore to undertake. Evaluating and confirming a Justice to sit on this nation’s highest court should not be an exercise in political brinkmanship and partisan posturing. It is a serious obligation, performed on behalf of the American people, to ensure a highly qualified candidate fills a vacancy on the Court. That obligation does not depend on the party affiliation of a sitting president, nor does the Constitution make an exception to that duty in an election year. The Senate has never taken more than 125 days to vote on a Supreme Court nominee, and on average, a confirmation or rejection has taken just two months. This Senate has almost a full year to consider and confirm Judge Garland. It should begin that work immediately by giving Judge Garland a full and fair hearing followed by a vote. That is what the American people deserve, it is what our Constitution demands, and with millions of people’s lives in the balance, anything less is entirely unacceptable. Judge Garland is a strong nominee with decades of experience on the bench. My Republican colleagues have called Judge Garland a ‘consensus nominee’ and said that there is ‘no question’ he could be confirmed. Refusing to hold hearings on the president’s nominee would be unprecedented. President Obama has done his job. It’s time for Republicans to do theirs. I call on Sen. Grassley to hold confirmation hearings immediately and for Leader McConnell to bring the nomination to floor of the Senate if Judge Garland is approved by the Judiciary Committee. We’ll continue to update with more responses as they roll in. Read more on Obama’s nomination of Merrick Garland to the Supreme Court.